Have you ever wondered that when you need some information from any company’s customer service, be it their phone based or website based; things are never to be found when YOU NEED it! If you check their website, you keep clicking on links and there are tons of advertisements and offers to be seen, but not that simple piece of information which you need. 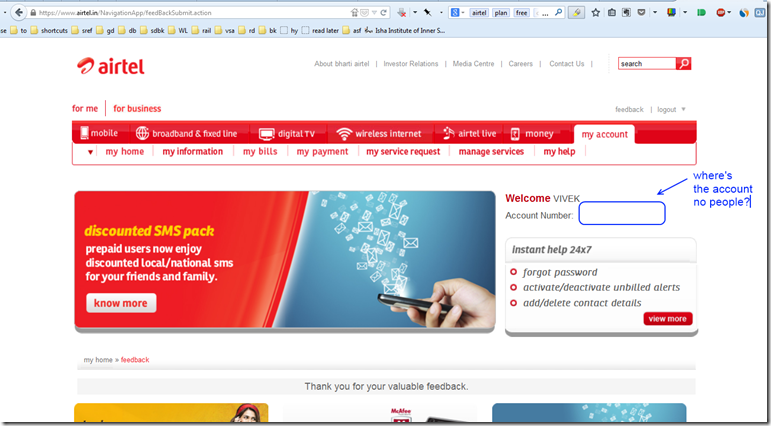 I have both prepaid mobile and broadband/landline from Airtel. 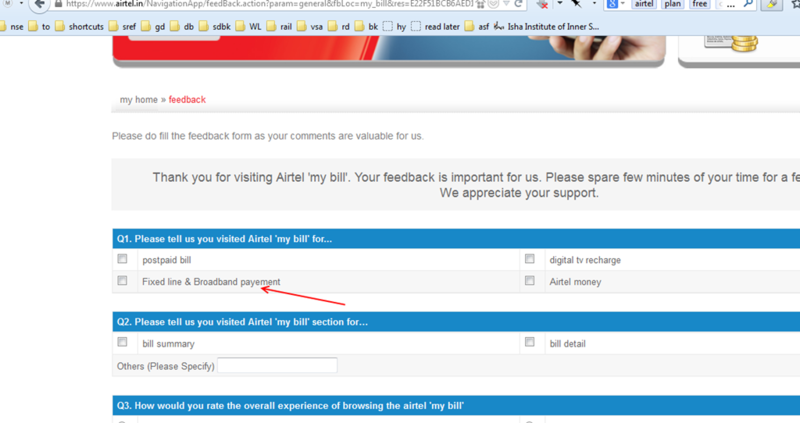 So today I wanted to see my broadband plan details at Airtel website. 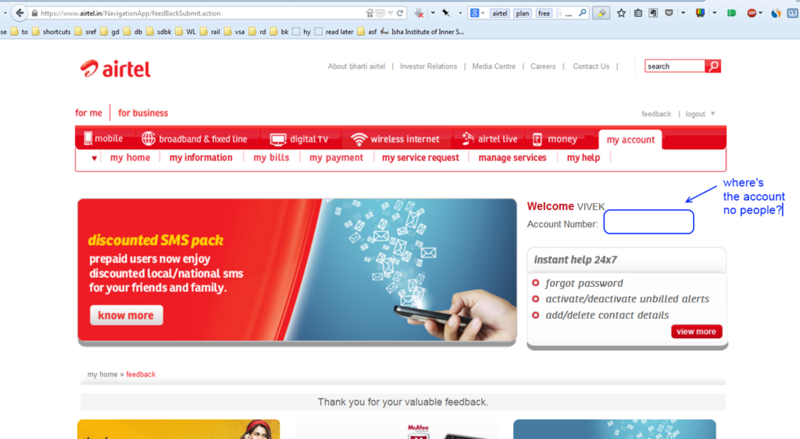 Logged in successfully, but it won’t let me see anything except the prepaid mobile information. I tried clicking on broadband tab too and logged in from there, but still it won’t show me anything except mobile related information. On closer scrutiny, I found that it was saying messages like “temporarily unavailable”, “unable to process your request” and the like. Here are some screenshots which I captured during the exercise. 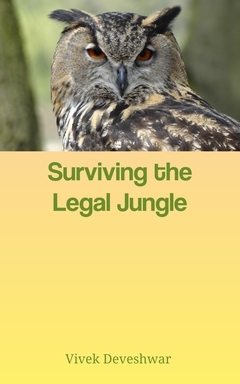 I had just kept them for my own record and no intention of making this post, but got so frustrated that I had to make a public post of the problems I found to get it out of my system. Of course I am emailing their customer service a link to the post once it’s done. 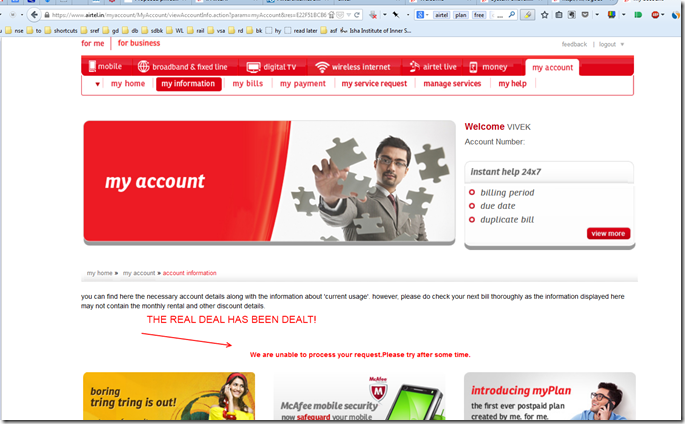 Hope this will remain as a permanent record for Airtel customers to see and point Airtel to this post every time they claim to have superior IT systems, great customer service, being always “happy to help/serve” and whatever the latest marketing jingle advertisement they are throwing these days! 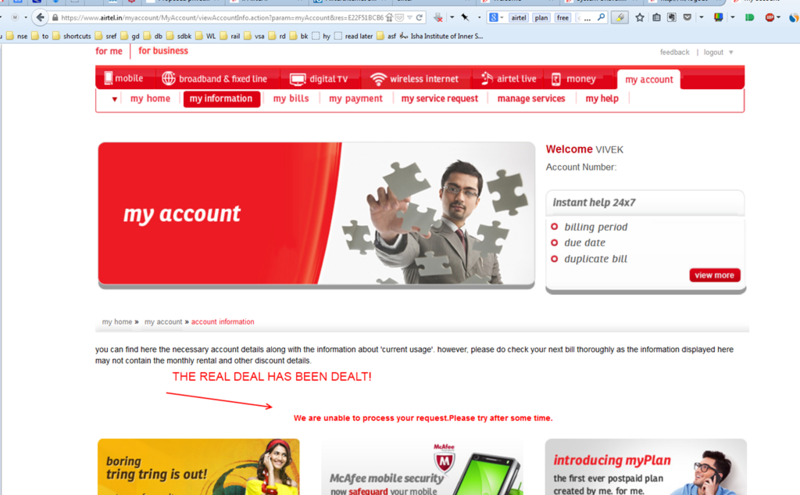 Another screen after supposedly successful login. It says my name right, but the account number is missing. And then another screen which has all the advertisements and offers, but not the information it is supposed to show. And last but not the least that great page called feedback, inspired from packaging on a Chinese electronics product, with wrong spelling on feedback page itself! 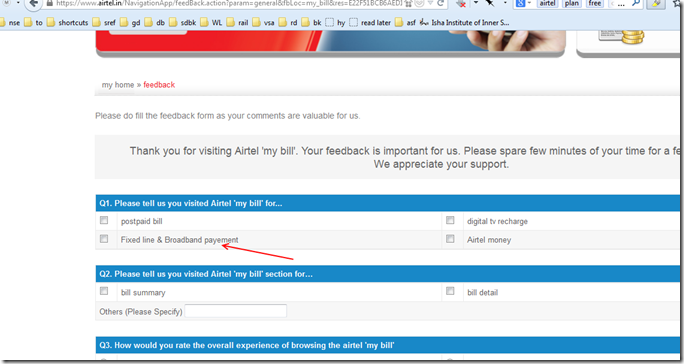 And so today I have given my feedback on Airtel!